Muddy Loafers: BAYA MAHIEDINNE – PICASSO’S INSPIRATION. BAYA MAHIEDINNE – PICASSO’S INSPIRATION. 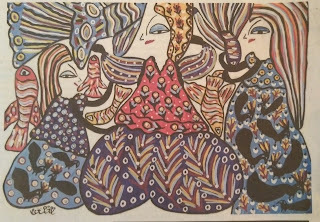 Some people are born artists and Baya or Fatima Haddad of Algeria was one such gifted person. 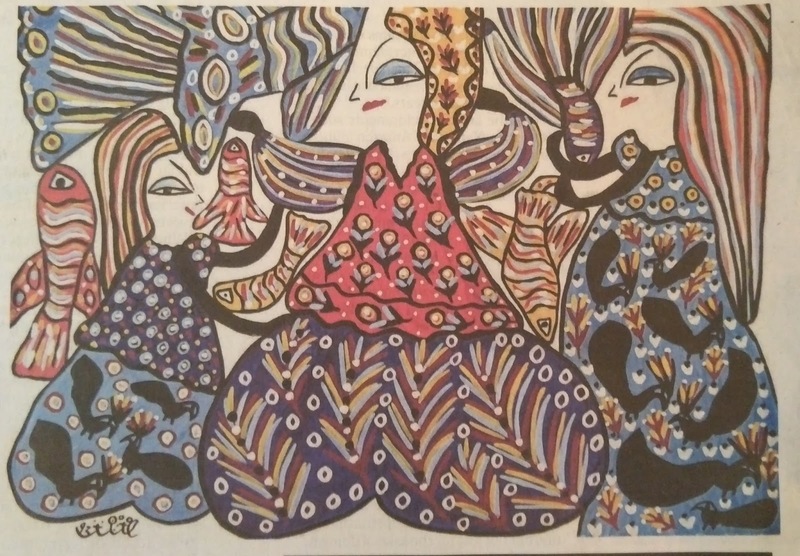 Born in 1931 at a village called Bordj El Kiftan in Algeria, her talent for painting was evident even before the age of ten. Orphaned at the age of five, she was brought up by her grandmother. As a teenager she worked in the house of a French lady Marguerite Caminat, as a domestic help. This lady spotted her talent and encouraged Baya to draw and paint, even supplying her with paint, paper and whatever else she required. Later, Baya was legally adopted by her. In 1952 Baya married an Algerian musician and composer Maheidinne Mahfoudh. Baya threw herself into domesticity, temporarily forsaking painting, to bring up six children in the years between 1953-1963. But she returned to painting in 1967 with renewed vigour. She was completely self- taught and painting was her passion. Totally illiterate, she could barely sign her name. Baya’s output was copious. Her subjects were women in colourful dresses, children, animals, flowers, fish and butterflies. Her colours were vibrant, her outlines bold and well defined. Baya’s work was exhibited in Paris and Algeria. Some of her paintings were printed on postal stamps. She also tried her hand at pottery. Critics called her work primitive, naïve or surreal. Some saw similarities with Islamic or African tribal art. It did not bother her or affect her work. She only allowed her environment and imagination to influence her artistry. Though invited to settle in France, Baya preferred to stay in Bilda Algeria until her death on November 9th, 1998. This humble lady’s tribal art fascinated the western world. Thanks for great information...I really happy to visit this post. It is very informative.